"Slightly haunted. Nothing serious, though," he wrote. "When I was writing it, I had been thinking about it, and I went back and forth," Leeson explained. "The way I worded it -- I was trying to keep it light. I have been reading online, and people saying you are supposed to disclose it. I don't know the laws here, but thought better safe than sorry." Turns out Leeson didn't technically need to disclose a haunting -- even a slight one. Pennsylvania real estate law requires sellers to disclose all material defects they are aware of, says real estate agent and former lawyer Frank L. DeFazio of the Center City Team in Philadelphia. "Knowledge of psychological impairments such as deaths, murders and haunted houses are not required [material] disclosures under Pennsylvania law," he explained. "How do you disclose a haunting? Even if court says yes it is a material defect, you have to prove it actually exists. How [do you] prove it? Call Ghostbusters?" Owner Leeson isn't even entirely sure that his 1901 home is haunted; he says he believes more in a scientific explanation for things. 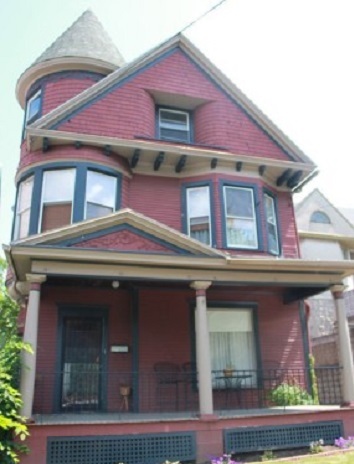 However, he does admit there are some oddities that have occurred in the Dunmore, Pa., Victorian, currently listed for $144,000. He described occasionally hearing voices in his daughter's room when she was an infant. "It sounded like there was a person in the room with her talking. We'd go in, and she was just sitting there. But she normally cried constantly," he said. "Doors slam shut, but it's an old house. It's not that often. I used to have roommates, and my wife's friend swears the house is possessed. I have other friends that come over and say it's the most calming house they've been in." Even if Leeson isn't convinced the home is haunted, describing it as so has been good publicity. He decided to list the home as for sale by owner. His plan was to always try listing it formally with an agent if it didn't sell, but with the amount of interest the home has garnered, he likely won't need to go that route. "I've gotten a lot of offers," he said. "I guess any publicity is good publicity. I think it's helping in the long run. It's a nice house. If it's getting it out there and a buyer likes the house, they probably won't be dissuaded." Inside the 'Slightly Haunted' Home in Dunsmore, Pa.
What's It Like Living in a Haunted Home? 10 Most Haunted Homes in the U.S.